I love the beach; I've always loved the water, there is something in the air at the beach that seems to make stress simply disappear. I think a lot of people in the Southeast have grown up spending summers popping down to one beach or another; we're so close to so many great beaches and coastal towns. Fellow Raleigh native, and current Charleston mom Katherine McElroy has spent the past few years bringing a little bit of beach to we unfortunate landlocked ones. Katherine grew up crabbing and fishing the beaches of North Carolina, and has used her love of all things coastal as inspiration for her absolutely stunning acrylic paintings. 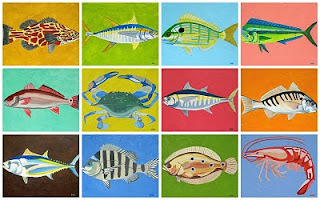 Her paintings feature a wide range of marine life, all painted in vivid, summery hues.The pictures here are compilations of many of the choices Katherine offers; pick your favorite fishy-I love the crab! I adore her work; I am not a fisher(woman), but I like to give it a try every once in a while (I caught the same shark about 3 times once-or at least he looked the same to me), and I feel like she gives a blue fin tuna new life. The colors and subjects honestly capture how I feel when I'm on the water. 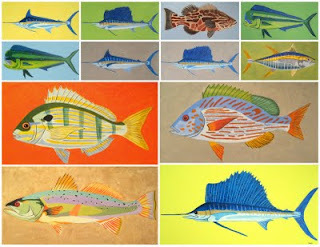 There is everything from a marlin to a blue crab, and she can tailor to your favorite color palette. 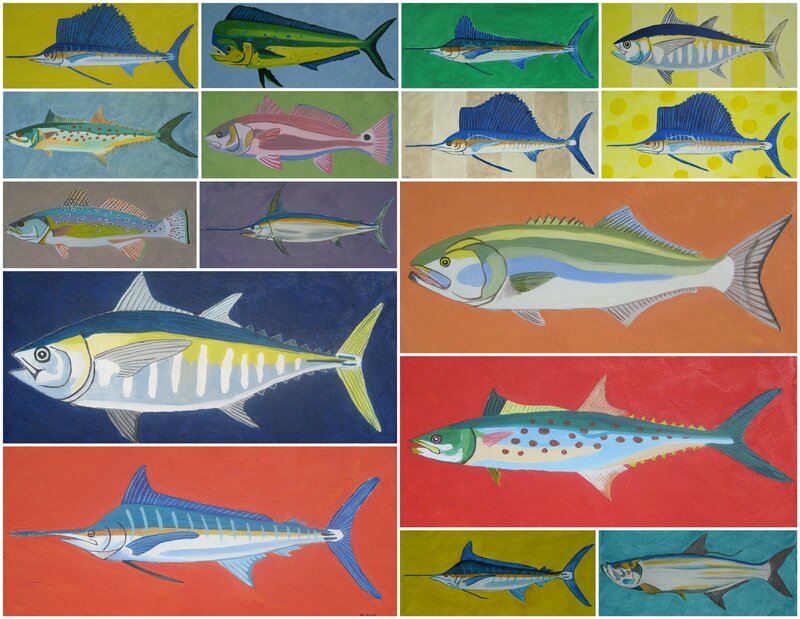 If you grew up with the same love and appreciation the coast, you are certain to love Katherine's work. 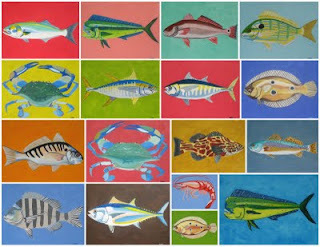 Katherine has a catalogue of fish and friends you can choose from for your own original painting, and she can do them in a range of sizes and as I said whatever colors you may want. They would make a great gift for any fishermen you may know, and they are perfect for those who enjoy the coastal lifestyle (but maybe from afar)(for now). If you don't have a spare wall, you can get your fix with this set of 12 notecards!